"wind-swept seas of grass and wildflowers"
One fifth of the Earth's land surface is grassland. Major grasslands of the world are found in the African savannas, the Australian grasslands, the cerrado and campo of South America, the prairies of North America, and the Central Asian steppes. Grassland is a biome which is found on every continent except Antarctica. About 800 million people live in grasslands. that led to a mass exodus from the Great Plains of the U.S. The vast grasslands of the Great Plains and the Great Basin in the United States were once inhabited by many different Indian tribes and abundant wildlife. 20 million bison thundered across the plains, which the Indians depended upon for food and clothing. Some described it as "great herds of buffalo as far as you could see." Then the Homestead Act of 1862 brought 6 million settlers, and so began one of the worst environmental disasters in world history. Over the years as the settlers moved out over the plains, they brought cattle and sheep and set them to grazing in the grasslands. They slaughtered millions of bison, almost to the brink of extinction. By 1889 only 541 bison were known to be alive in the U.S. The Indians had been deprived of their main source of food. The settlers farmed the land once covered with bluestem, buffalo and grama grasses. The topsoil was plowed up and with it, the extensive root systems of the native grasses. The farmers planted grain crops such as barley and oats, and mostly wheat. Then early in the 1930's, an eight-year drought began, and a series of major wind storms swept over the Great Plains and the Southwest creating huge smothering dust storms. The soil in the grasslands had become dry and loose from plowing and the damage caused by livestock grazing. The roots of the grain crops could not hold the dry topsoil under such severe winds. Tons of loose soil was picked up and carried for hundreds of miles. Fences were buried by huge drifts and dirt had to be shoveled out of houses. 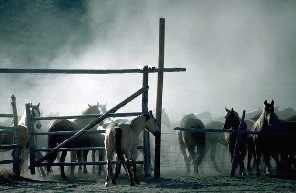 The dust was so thick vision was obscured, lungs were damaged, and some people even became lost. The southern Great Plains became known as the Dust Bowl. The land became so damaged there was very little to harvest, so thousands of farmers and ranchers left to seek their fortunes elsewhere. Many continued west into California. It is estimated that some 50 million acres of land were damaged and 50 million more endangered. The worst damage occurred in Oklahoma, Kansas, Colorado, Texas and New Mexico. You can see that because of the improper intervention of humans in converting the natural grassland ecosystems into grain crops, allowing the remaining grasslands to be overgrazed, and not using proper farming methods, the land was unable to withstand such a long drought period and unusually severe wind storms. The government set up programs to help restore the land, and they taught the remaining farmers how to protect the soil and slow erosion. The settlers began to restore and protect the land, and they planted trees as windbreaks. The land, the Indians, the settlers, and the bison species had all suffered greatly, and harsh lessons had been learned. Around the world in many countries, people are still suffering, species are in decline, the weather is becoming more severe, and ecosystems are being decimated. We now know that starvation, disease, war, environmental damage and devastation of biodiversity in any one area of the planet affects the sustainability of the whole living system. All of our ecosystems, whether they be rainforests, coral reefs, glaciers, wetlands, temperate forests, coasts, watersheds, or grasslands - all are systems that have developed over centuries and thousands of years, and they are what have allowed life to flourish on this Earth. All species, both discovered and as yet undiscovered, play a crucial role in the survival of other species. We have learned some hard lessons - but we are learning, and many efforts are underway around the world to help our fellow human beings and the environment of our living planet. The Dust Bowl - Dust Bowl photos from the U.S. National Archives. See pictures of days turned into nights as 2-mile high black clouds of dirt roared and rolled over the Plains, obscuring sunlight. Read about the hardships of survival. Special Features - Eyewitness Account of surviving the Dust Bowl, and government response to the plight of Dust Bowl farmers. Maps - Shows huge area affected in Colorado, Kansas, New Mexico, Oklahoma and Texas. People and Events - The Great Depression, The Drought, Black Sunday, Mass Exodus from the Plains, The New Deal, Works Progress Administration. From the Neal Smith National Wildlife Refuge near Prairie City, Iowa, The Refuge is the largest re-creation of the tallgrass prairie ecosystem anywhere in the United States. 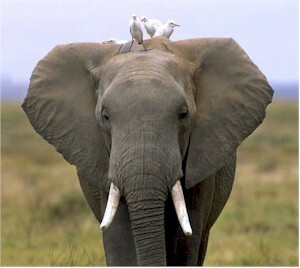 African and Asian elephants are currently the largest land animals, with the African species being the largest. Both species are threatened by shrinking habitat and poaching for the ivory trade (They are killed for their ivory tusks. Help save animals by not purchasing products made from animal parts, such as ivory tusks, animal paws, rhino horn). Neotropical Grassland Conservancy - Learn about grassland types and tropical savannas. See definitions for some related words and view map of Grasslands of South America by type. Bell LIVE! 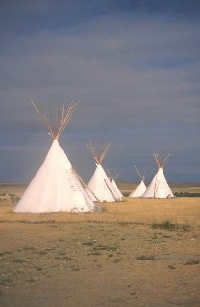 Presents "On the Prairie"
Online activities and resources. Links to resource material for educators. Seas of Grass and Who Lives in Grasslands? (four million acres in all). 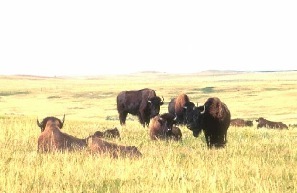 Read about the conservation programs which are helping preserve the grasslands and prairie ecosystems. Click into the Grasslands Locator to find information about the habitat, birds, wildlife, and wildflowers in our national grasslands. "The stunning hills and vistas in this region of Kansas are a rare remnant of the vast expanse of tallgrass prairie that once covered much of central North America." Click on Teacher's Corner and then the various links to History, Archaeology, Geology, Climate, Wildlife and Biology, and Culture of the Prairie. 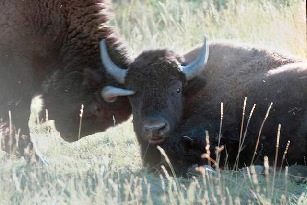 Scientifically, the American Buffalo is named Bison. It belongs to the Bovidae family of mammals, as do domestic cattle. 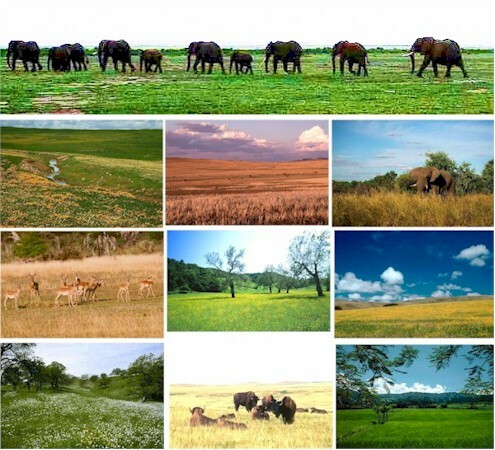 world's grasslands and their inhabitants. Meanwhile this leopard is going to take a nap. Speaking of naps, we must have been napping when we referred to this big cat as a cheetah. Clayton Pope, wildlife professional, "spotted" the error, and we appreciate him writing and bringing this to our attention. African Wildlife Foundation - Check out the Wildlife Library (wait while page loads completely - status bar will show "Done," but wait another second or two). Click on list of African animals to see pictures and learn about them. Here is where you can compare the differences between the leopard and the cheetah - without having to get too close!